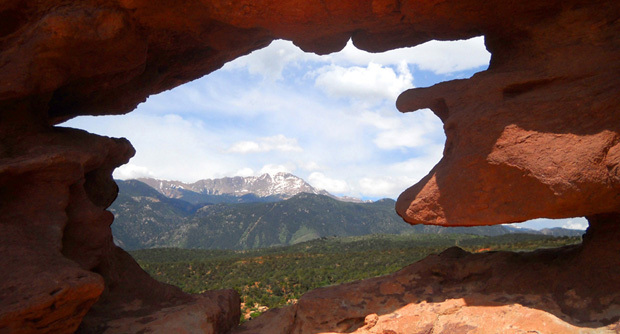 lead you to beautiful waterfalls, Indian rock shelters, and pioneer ruins." 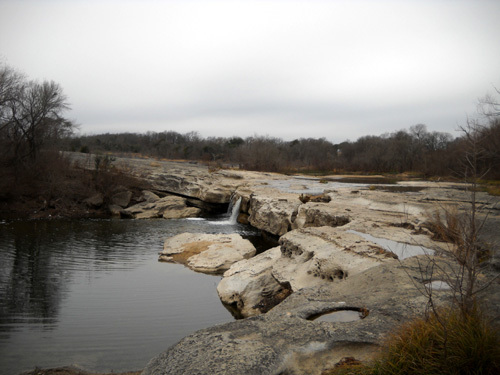 This series of three entries features the ten days we just spent at McKinney Falls State Park in southeastern metro Austin, TX. 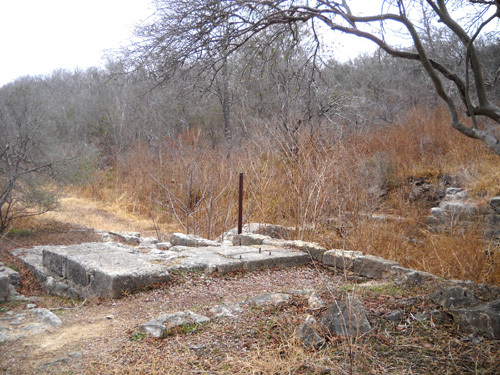 I'll describe our trail runs, walks, and bike rides in the park and on Austin's fabulous Town Lake Trail, other activities we enjoyed in Austin, and trips we took to nearby Bastrop and Buescher state parks. This is the first time we've visited those two parks. The first part of this entry is a trip log through southwestern Texas from El Paso to Fort Stockton with information that might be helpful to other travelers, particularly RVers. 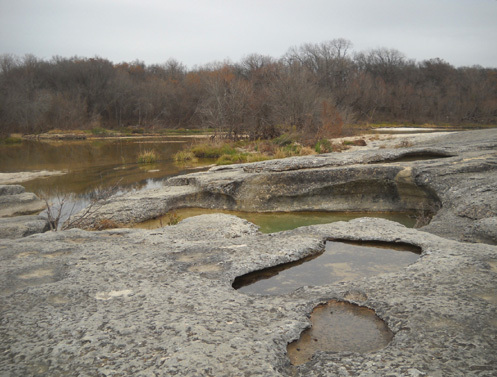 If you aren't interested in that part, just scroll down to the sections about McKinney Falls SP and Austin. 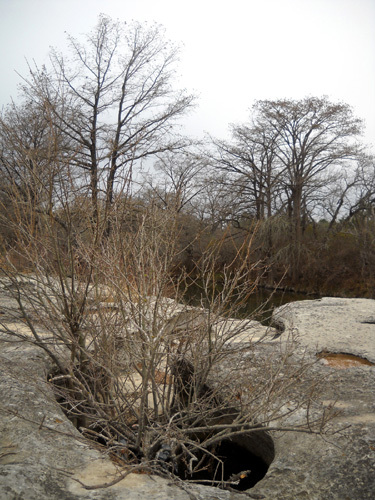 Photos throughout this entry are from McKinney Falls. 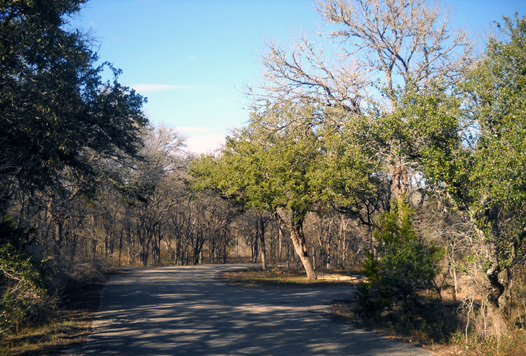 We planned to leave the campground at Fort Bliss in El Paso on early Sunday morning, January 9, and drive to South Llano River State Park, just off I-10 in the Hill Country near Junction, TX for one night. That would have been a new park for us. 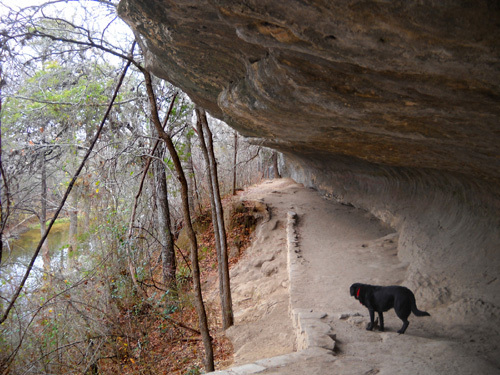 We thought we'd check out the trails on Monday morning, then drive the remaining distance to McKinney Falls State Park in the afternoon. However, a powerful windstorm in El Paso that rocked our camper all night Saturday and still gusted to 50 MPH on Sunday morning changed our plan. We thought it would be too risky to drive a high-profile 5th-wheel coach in wind like that through desolate, open southwestern Texas terrain. Sunday morning, with the camper still shakin' in the wind, we rolled over and got some more shut-eye! Our new plan was to stay one more night in El Paso and drive the whole way to Austin on Monday. 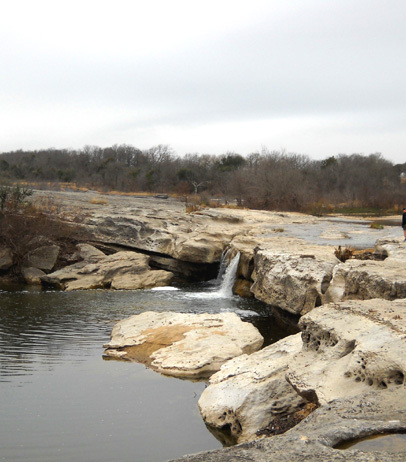 That's when our reservation began at McKinney Falls. That's a long haul with a camper in tow, but the wind wouldn't be as much of a factor. 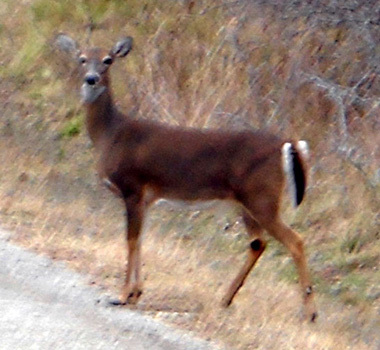 Above and below: lots of white-tailed deer roam around the campgrounds at McKinney Falls Park. After we got up that Sunday morning we kept checking the weather reports between El Paso and Austin. A local TV station weather-cam showed videos of vehicles on I-10 that looked like they were driving normally but we didn't feel better about the wind until we talked with an incoming RVer about 11 AM who'd just driven in on I-10 from the east. He said he could go "only" 60 MPH** westbound into the head wind but reassured us that the wind had died down enough east of the city that it should be safe for us to drive our camper on the freeway -- especially since we'd have a tail wind going opposite the direction he drove. Within an hour we ate lunch and got ready to go. Our new plan was to drive to the Walmart at Fort Stockton, TX where we've stayed overnight a couple times before. 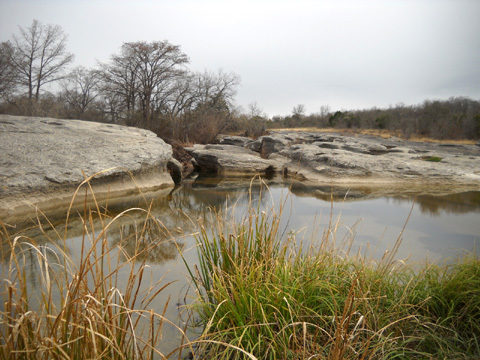 It wasn't practical to drive as far as South Llano SP that afternoon. It was sunny, 52� F., and less windy on I-10 than at the campground when we left Fort Bliss about noon. The west wind meant we had mostly a tail wind all afternoon. We got the best fuel mileage we've ever had with the Cameo -- an average of 14.7 MPG! That's hauling a 5th-wheel weighing somewhere between 14,000-15,000 pounds. It helped a little bit that we had a net 1,000-foot drop in elevation. 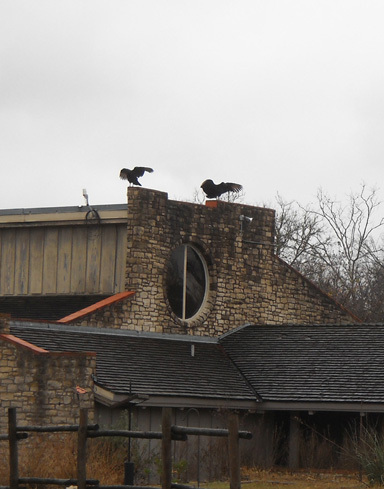 Vultures (hawks?) take flight from the roof of the visitor center. Others watch our movements from nearby trees. Once we were clear of the El Paso metro area there was little traffic on I-10. After I-20 branched off, we practically had the road to ourselves. Once again, our 60 MPH speed didn't impede those wanting to go the 80 MPH speed limit or faster (70 MPH for semis). Going eastbound we encountered a border patrol inspection station at MM102. Jim answered the guard's two questions correctly and we were on our way. That's never a good place to test someone's sense of humor . . .
Four motorhomes beat us to the Fort Stockton Walmart parking lot but there was plenty of room for more on the west side of the store. Three more RVs came in after us. We were happy to have good cell phone, internet, and TV reception at this location. Through most of western Texas we had a weak Verizon signal and extended service. As usual, we did some shopping inside the store and thanked the night manager for letting us stay overnight. We got diesel at a Fina station across from Walmart for $3.29/gallon. The cheapest we saw in that town was $3.24. Ouch. Fortunately, fuel prices were lower in Austin. 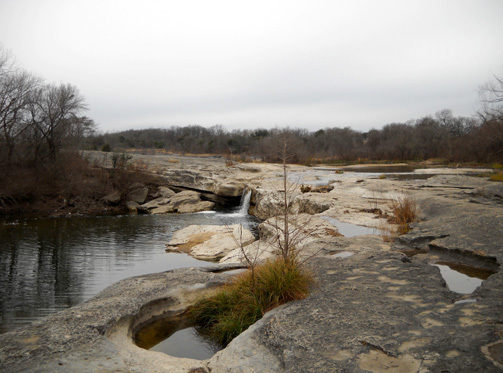 We left Fort Stockton on Monday morning, January 10, to drive the remaining distance to McKinney Falls. That took us about seven hours with several stops. We had hillier terrain, more two-lane roads and city driving, more cross- and head winds, and weather varying from sun to fog. Despite a net drop of another 2,500 feet in elevation, our average fuel mileage fell to about 11� MPG. We really can't complain about the weather we had that Monday. Even though it was 20�F. below normal temperatures (40� for a high instead of 60�), we were in a wedge of fog between the rain that doused San Antonio a bit to the south and the snow and ice that fell above I-20 just to the north and left a big mess in Dallas. The storm was even worse through Louisiana, Mississippi, Alabama, and Georgia, where 9-11" of snow fell in some places! This is the third or fourth nasty storm the Deep South has gotten this winter. The worst we got that day was some fog and mist. Temperatures were predicted to drop to the teens in El Paso that night. Although it was below freezing in Austin our first night, it was a good decision to leave El Paso when we did. 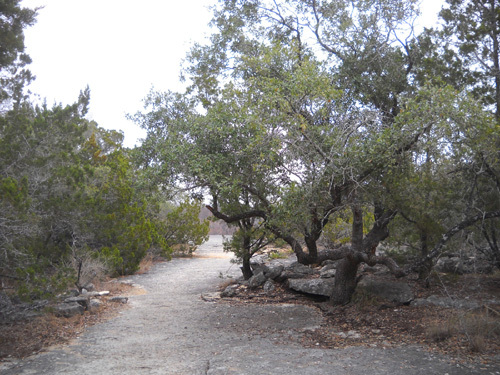 We weren't much farther south in Austin but we were at a significantly lower elevation: 3,500 feet lower. Traffic was very light on I-10 for over 200 miles -- even on a weekday -- and we continued to see lots of RVs going the other direction. We were happy to spot one Carriage Cameo 5th-wheel and one Carriage Carri-Lite (that's a fancier model than ours). Note to RVers who need to dump their grey or black water along this route: there is a free dump station at the rest area at MM393 west of Sonora on I-10. There may be more but that's the only one we noticed. We left the freeway at exit 477 and followed US 290 to Austin. 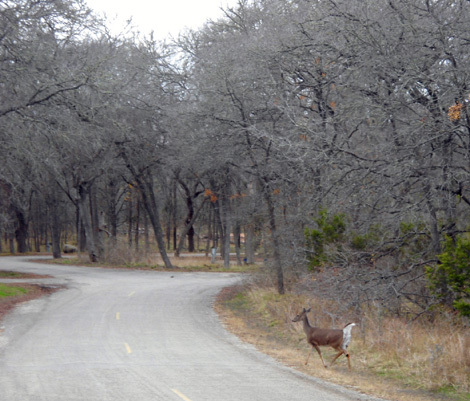 This is a good two-lane highway that takes travelers through historic Fredericksburg and scenic Hill Country terrain. The speed limit is 70 MPH. Although the road is hilly there are plenty of places faster vehicles can pass slower RVs. There are several pull-offs on either side of the road but they are fairly small. We stopped at one for a few minutes and took up the whole parking area. We were happy to find diesel at the HEB in Dripping Springs (a little west of Austin) for $3.05/gallon. Jim had some difficulty finding a place to park in the adjacent strip shopping center while he went into Whataburger to get (what else?) a burger. We were surprised to see so many people shopping at 2 PM on a weekday. 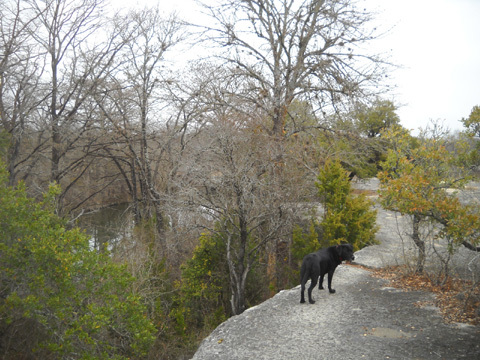 Soon after, we were through Austin and checking into McKinney Falls State Park. This is the third time we've camped at this park. It's very convenient to the places we like to go in Austin yet is far enough out in the country to have a wilderness feel. 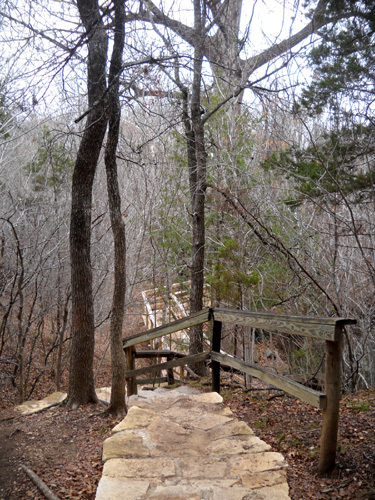 I wrote two entries about the park campground and trails on our first trip here in December, 2009. 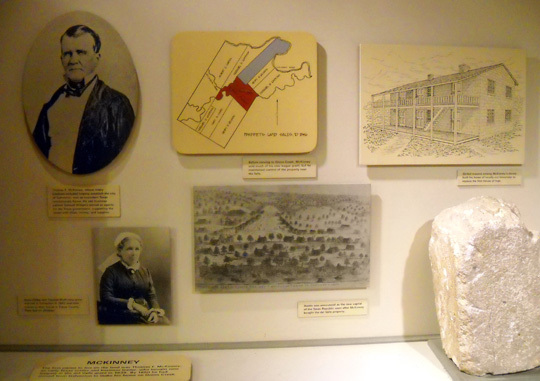 The first entry includes information about the history and features of the park, describes the campground, and shows photos of the two falls. 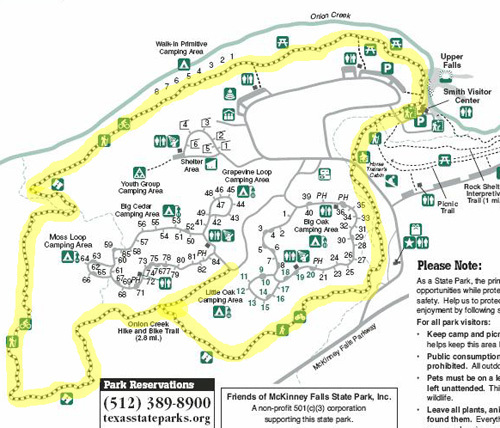 The second entry focuses on the park trails we explored then. We also stayed here for a couple of days in January, 2010. I won't repeat all of that information here, just present some updated information and photos. 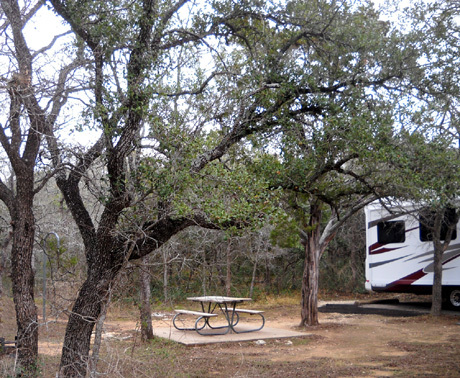 We got a nice surprise again when we checked into the campground -- our Texas state parks pass is still valid and we still have two half-price days left for camping! We used one of them during our stay. I think I've figured out what happened regarding our parks pass but we won't know until we have the courage to ask when the computer says it expires. So far we've avoided doing that -- might jinx our good luck! When someone tells us it's expired, we'll buy a new one. I know the last time we paid for an annual pass was at this park in December, 2009. It should have expired at the end of December, 2010. However, the state completely revamped its computer system for reservations and accountability in May of 2010 and began using it at all the parks on the morning we were checking into Palo Duro Canyon. We were there early, one of their first test bunnies that day. Pools of water collect in the rocks above the lower falls. I wrote then about the hour we had to wait for the staff to process our reservation when we checked in. New system, lots of headaches for the office staff. Folks were lined up out the door -- common on a Friday evening but not a Wednesday morning. Back to this trip to McKinney Falls . . .
We originally reserved a site for seven days, not ten. It included the potentially-busy MLK holiday weekend. 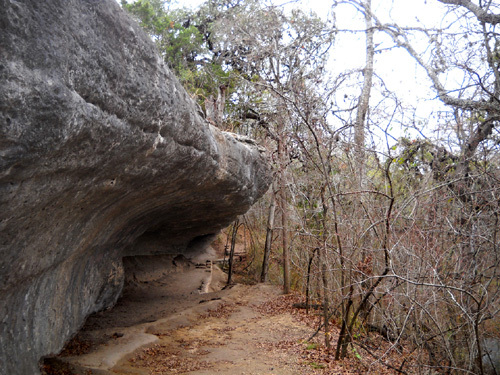 We wanted to check out nearby Bastrop SP before deciding whether we would spend three days there. 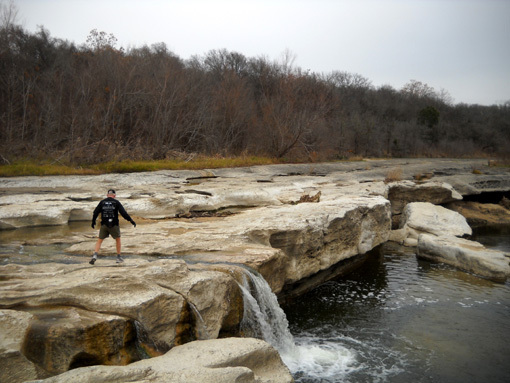 We ended up staying at McKinney Falls the whole ten days because the RV sites are nicer there. The rate for a 30-amp site is $16/day ($20/day for one of the twelve 50-amp sites). We got one of those days at half price, reducing our total for one week to $104. When we decided to stay three more days we paid an additional $48. 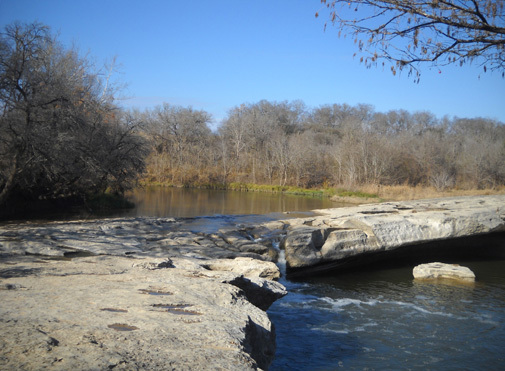 McKinney Falls does not have a weekly rate like some Texas state parks do in the winter but its campground rates are less expensive than the parks that charge $20 to $25 for 30- and 50-amp sites. 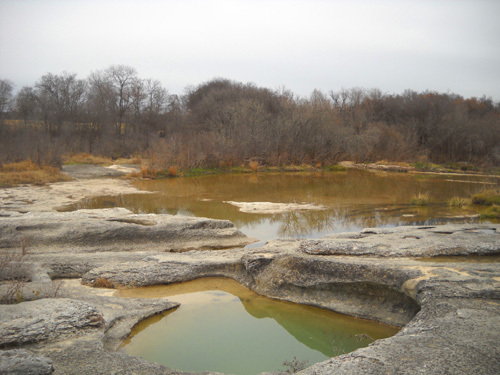 Each site has water. There is a dump station near the entrance to the first campground loop; only the CG host sites have sewers. We chose a different site in the same campground loop (Big Cedar) where we stayed previously but later wished we'd gotten a site in the Big Oak camping loop; the 30-amp sites are more spacious there and it's a little closer to the entrance and trailheads. We could have moved to another site but it was easier to stay put. No one ever camped in the sites on either side of us so we had plenty of peace and quiet. We had excellent TV reception at our campsite with just the RV antenna but our MiFi internet connection was slow with only 1-2 Verizon bars. When Jim wanted a faster connection he'd use the park's WiFi system at the entrance station or visitor center. Visitors can go inside when the buildings are open or sit outside in the parking lot in their vehicles (what Jim usually does) to get online. We sure know how to pick 'em! Areas of the Southwest to hang out during the winter, I mean. The first evening at McKinney Falls we heard on the local news broadcast that it was "the coldest this winter in Austin." 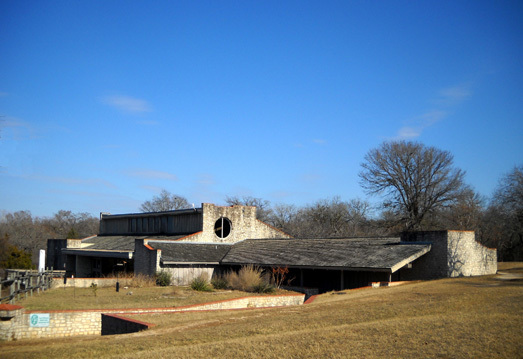 The average temperature range in Austin this time of year is about 40� to 60�F. The first four days our thermometer didn't get up to 40� during the daytime. Nights were below freezing, even down to 23� one night. The rangers advised all the campers to unhook their water hoses each night and let the outdoor faucets drip so they wouldn't freeze. Jim filled our fresh water tank the first afternoon so we'd have adequate water for drinking, cooking, showers, and the toilet. We kept the camper warm enough with the propane furnace (necessary at night to keep the pipes in the basement from freezing), two electric heaters, and the occasional use of our rather new propane space heater, which is more efficient than the furnace. In fact, the camper was so cozy it was tempting to stay inside instead of going out to walk, run, ride the bike, or run errands in town! Six of the ten days it was overcast, foggy, drizzly, and/or rainy. At least we didn't get any snow. We had sunshine for only four of the days we were in the area. 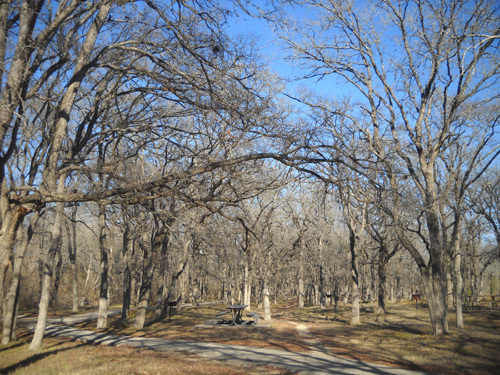 We forced ourselves out the door every day to exercise in the park or at the Town Lake Trail in Austin; it wasn't always fun but it helped reduce cabin fever and keep our spirits up. 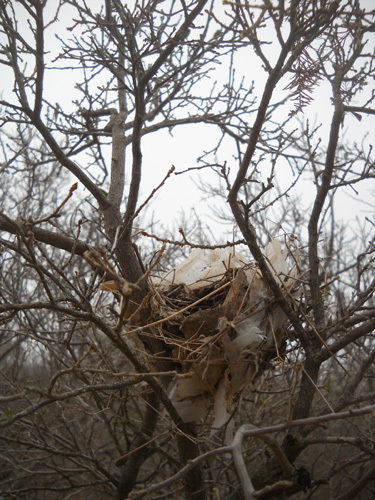 One gray day I found an old bird's nest full of feathers. Meanwhile, we read or heard that every state in the Lower 48 had some snow that week except Florida! Atlanta, which rarely got snow when I lived there for 25 years, had 4-5" of snow with 1-2" of ice under it. What a mess. We don't know how much snow and/or ice Roanoke got, but we do know it was even colder there. That didn't console us much. We wished we were in southern Arizona or southern California or just about anywhere that was warmer and sunnier than where we were. We both became more irritable and depressed, exhibiting mild signs of SAD (Seasonal Affective Disorder). Give us some sunshine at least! The lower falls were interesting even on cloudy days. Even my photos were "sad" on those days, with dreary, gray skies instead of bright blue ones. I want my travel photos to be sunny to inspire other people to visit the places I enjoy! Fortunately, the temperatures gradually warmed up a bit to the 40s and 50s after a week but it was still overcast or raining much of the time. 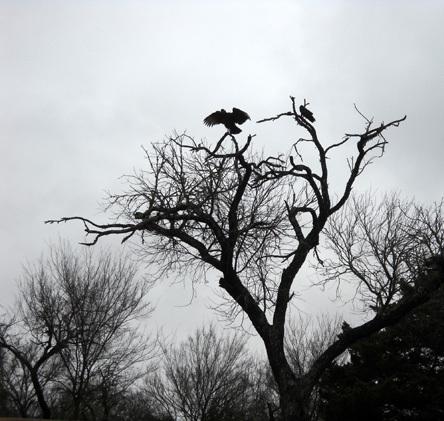 The sun didn't come back out again until the week of January 17 when it was almost time for us to leave Austin. Our last three days in the park were sunny and in the upper 60s, which was above normal. We loved those days ands stayed outside as much as possible. I took some photos over again then so I'd have some sunny ones to show you! 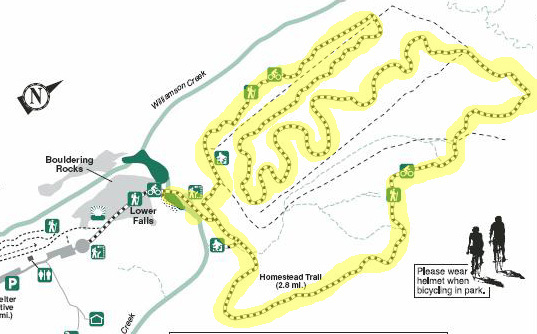 You can see a large map of the park and trails at this link. I'll include sections of it below. 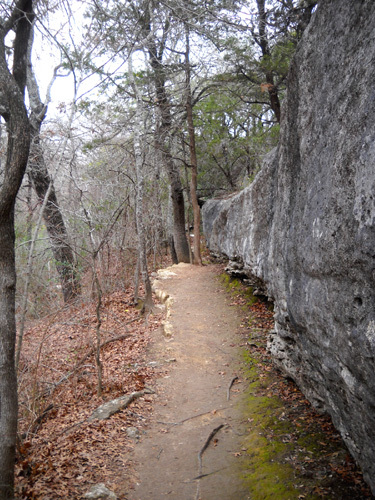 There are more photos from this trail in a previous entry from 2009. There are other photos from this area in the Janu-ugly section above. 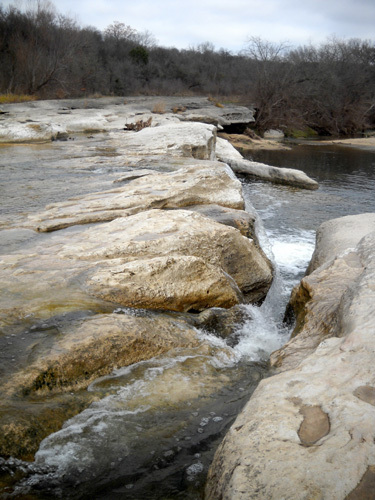 Despite the rainy weather, Onion Creek was lower than we've seen it previously. 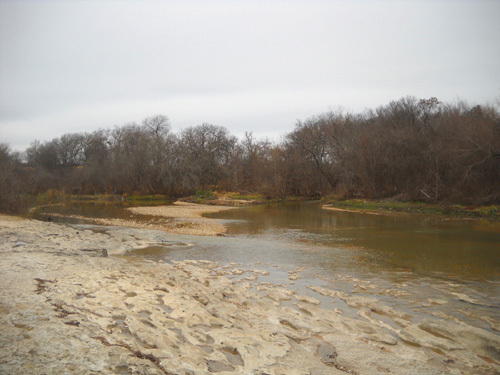 We've been tempted to cross the wide creek at the lower falls and explore the three-mile long Homestead Trail on the other side, but the creek was too high and swift when we visited the park in the winter of 2009-10. It was also so badly polluted then that the park warned visitors to stay out of the water. This year visitors are allowed in the creek. Since the water level was also down we were able to cross it at the lower falls. That was fun! 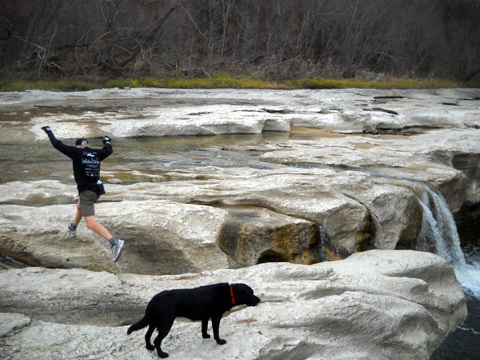 I chose to go upstream a little bit to cross those rocks, fearing the jolt on my knees if I jumped across like Jim did. My feet got wet but that was OK. Trekking poles would have helped on the smooth, slick rocks. That one required a running jump, too. 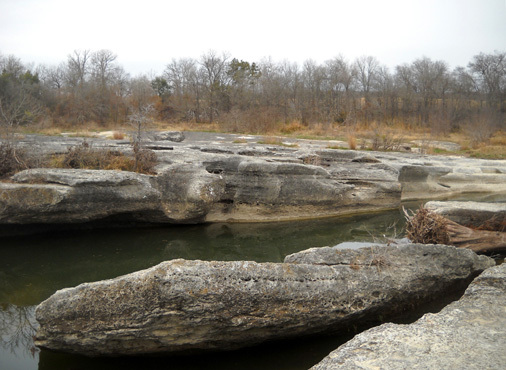 There are lots of pockets of water in the (relatively) soft rocks on that side, too. 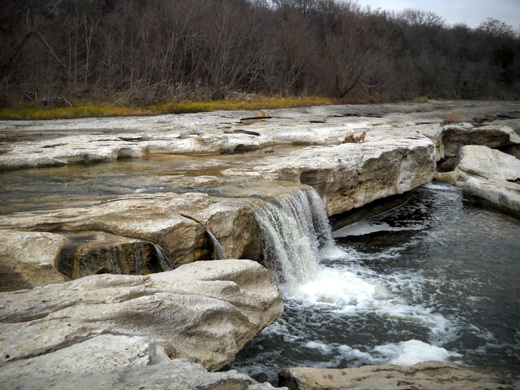 The pool of water below the falls is a popular swimming hole in the summer. Jim and I went different directions on the Homestead Trail that day but neither of us went more than half a mile. We planned to cross the creek another day when we had time to do all of the Homestead Trail and check out those other dotted lines on the map but we never did get back to it. 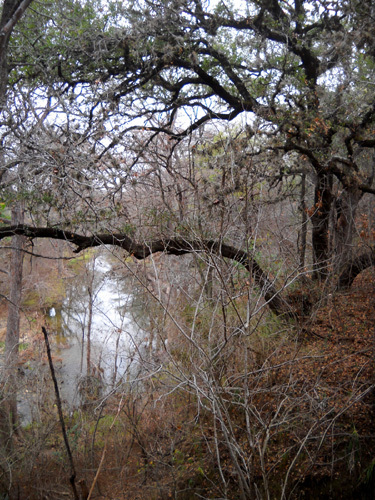 When it wasn't raining I went out on several bike rides on Onion Creek Trail and the paved roads through the park. I'd have ridden many more miles in better weather. 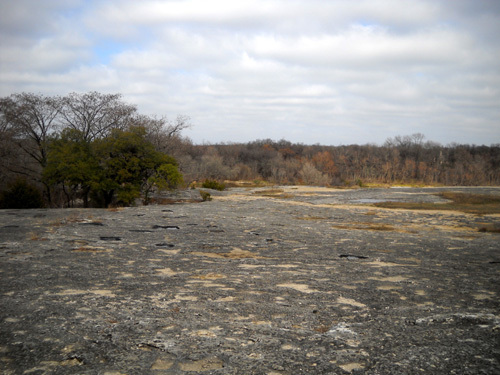 For more information and a video about McKinney Falls State Park, check the official park website at this link. Because of the dreary weather we weren't as motivated on this trip to explore new sites and neighborhoods in Austin as we were on our first visit to the area. 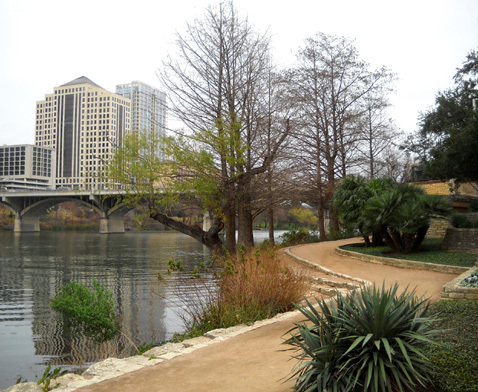 I'll talk about our walks, runs, and rides at Town Lake Trail in the next entry. We parked at the Town Lake YMCA each time we used the trail and I did several workouts inside courtesy of the Y's generous "away" visitation system. While in the vicinity we also had lunch at Whole Foods a couple times (that's the best Whole Foods store we've found anywhere) and shopped at REI. 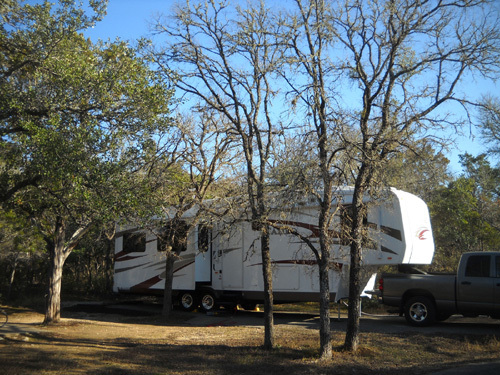 We also made several trips out of the park to shop at Walmart and Sam's Club, do our laundry, buy propane and diesel ($3.15/gallon at Walmart with their shopping card), go to the Post Office, and explore Bastrop and Buescher state parks. 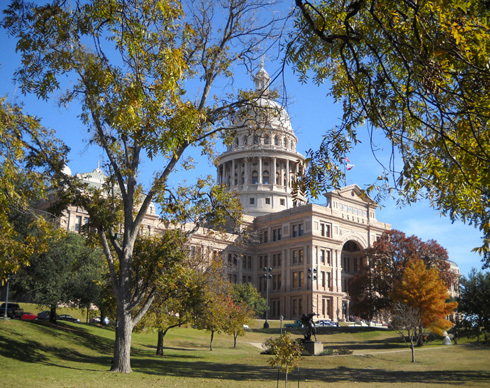 We enjoyed our visit to the state capitol building (photo above) in Austin a year ago but didn't go back this time. We figured it would be too chaotic. The state legislature began its biennial session last week. It is coping with a $27 billion budget deficit for 2012-13. Texas has two-year budgets, which makes its deficit appear higher. Traditionally it's been in better shape fiscally than many other states but the recession messed with Texas, too. One of the state's mottos is "Don't Mess with Texas," referring to littering but having more than one meaning. Fortunately for folks like us who enjoy using the state parks, we've heard that the park budget is in some sort of separate account and apparently won't be affected as much by the cuts the state will have to make in other departments and programs. I haven't researched that but hope it's true. We really enjoy the parks we've visited in Texas and plan to see a lot more of them in the future. 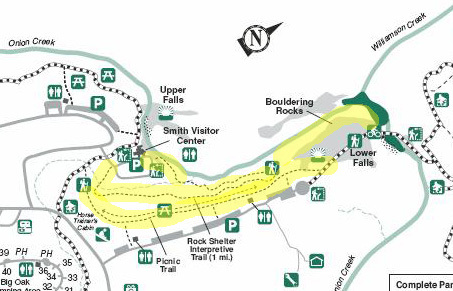 Next entry: Town Lake Trail rocks!